Pupils at The King’s School, Ottery St Mary are proposing a new shared use cycleway which follows the old railway track starting at Feniton through to Ottery St Mary. 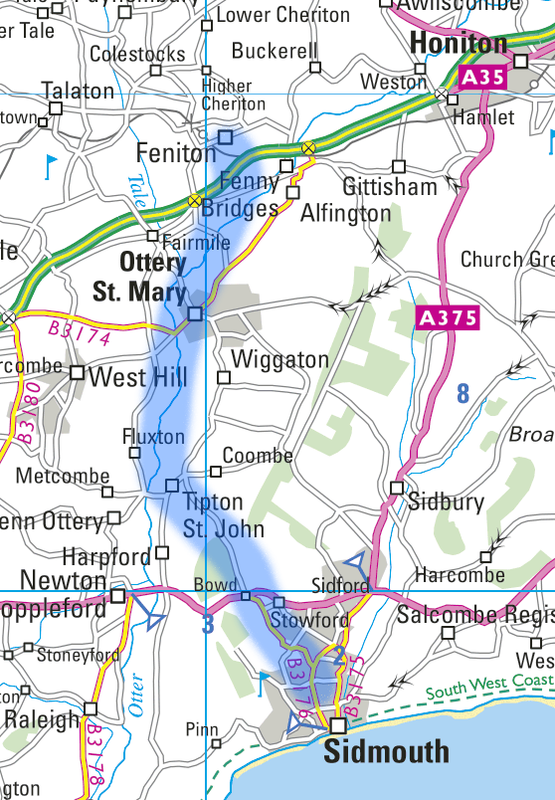 This will eventually link up with a continuation through Tipton St John and onto Sidmouth. This web site is used to help you access up-to-date information about progress. “As you are no doubt aware there was magnificent community support for the Tour of Britain event in the District which in turn has resulted in several members of the local community highlighting the fact that there is a strong need for improved cycling opportunities in the vicinity. 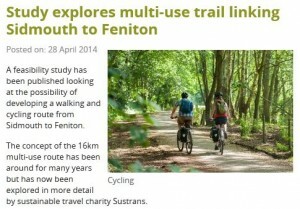 The Town Council therefore wishes to reiterate its support for the creation of a cycleway on the disused railway line between Feniton and Ottery St Mary and Sidmouth, in view of the considerable benefits such as sustainable transport, healthy people, and a boost to the local economy etc. January 2017: The Otter Trail Group and the Transport Section of the Sid Valley Neighbourhood Plan Steering Group have been awarded a Grant by the East Devon ANOB and Councillor Stuart Hughes to commission a SUSTRANS report to recommend improvements to the cycling infrastructure in urban Sidmouth and links to the surrounding countryside. This will include examination of the A3052 crossing near the Bowd. March 2016: Councillor Claire Wright kindly provides a Locality Grant to help fund a Civil Engineering assessment of the Works Required on part of the Trail. June 2013: The Otter Trail Group launch an on-line petition to allow the public to register their support. May 2013: SUSTRANS select Ottery’s Connect 2 Bridge as one of the best examples of community development in the country. If you would like to become involved or learn more about the Trail please contact us. Please sign if you wish to support the Otter Trail. Pupils at The King’s School, Ottery St Mary have proposed a new shared use cycleway which follows the old railway track starting at Feniton through to Ottery St Mary. This will eventually link up with a continuation through Tipton St John and onto Sidmouth. If there is enough local support now there is a better chance of this happening than ever before. Ottery St Mary have a good record of council, school and community cooperation in making things happen. This has been demonstrated by the successful completion of the Coleridge (Sustrans Connect 2) Bridge, which was recently highlighted as a nationwide example of community led development. To indicate your support for this proposal please ‘sign’ this petition. If you wish to be kept up to date with developments also tick the adjacent opt-in checkbox. Your email address will not be displayed on this site. Remember this project will need lots more public support if it's going to succeed. NOTE: You will be sent an email to the address you enter to allow you to confirm it is correct.